My name is Sali Samaké and I live in Tamala, one of the villages in the region of Djitoumou, in Mali. We’re proud of our past. We always refer to Djitoumou, an ancient land name, to indicate our village’s position to outsiders. I was born in Defara, a neighbouring village, but my parents no longer live there. I was 15 when I got married. Now I am 56 years old. Unfortunately I didn’t study until I was 30, when I was a housewife. During the last four years I have attended special lessons for adults conducted in Bamabara, my mother tongue, alongside many other housewives in this village. The courses can last three to four months, and I learnt many things. I remember when I started the lessons I couldn’t even recognise my own name written down. But now I can read and write. I’m really busy all the year round. During the dry season I go to the countryside far out of the village, sometimes with other women, to look for firewood. I take care of food and work alongside the men on the farm. I also look after my children’s education. I want them all to study even it becomes more difficult as they get older, because the village doesn’t have a high school. Children have to go to Welessebou, a bigger city seven km away where there is a high school. I’m worried about my son. He is supposed to enrol in the University of Bamako in the upcoming semester. In Bamako, the capital city, he will go to his brother who can take care of him. But my worry is about another issue. Unemployment is high among young people in Mali. This is why many of them want to go Europe. Like many other boys, my son dreams of migrating to Spain. I’m worried about his envy of life abroad because of the dangers he may encounter on the road to Spain. People are treated badly. Some of them die on the way. Sometimes I forget all these issues as I go about my daily duties. Getting the water I need is a real problem in my village in the dry season. I have to carry cans in a cart to a compound beyond the entrance to the village which contains the only well that has water in it all the year round. There are some other pumps in the village but they do not work very well. The new one is very slow, taking hours to fill a can. You have to ask for help to fill the whole can as it is very tiring work. Another well was contaminated and the water made many people in the village sick. People who drank the water lost their hair and their hands were dark. One person died in my family. After this disaster, the people who made the pump came back and analysed the water and said it must not be consumed by people. So we use it for our cattle and for washing. The only good pump in the village is used by many people. As a result it is always breaking down. It breaks down again two or three weeks after being fixed. It costs a lot of money to pay those the people to fix the pump and we don’t have much money. It sometimes stays broken for two or three months before we can afford to have it fixed again. 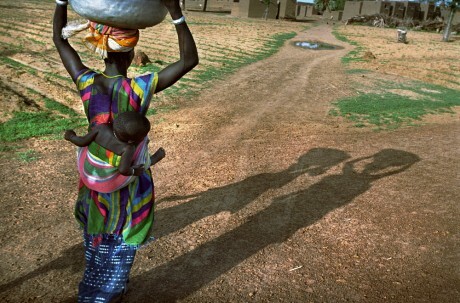 My community faces many difficulties and women especially find life very hard. If we had good water we could overcome many of the other difficulties.